Why do we groom cats? Of course we groom cats to make them look beautiful. 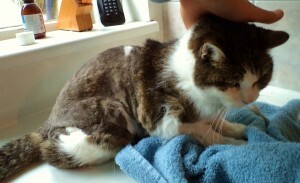 Even the cats that need to be shaved will look pretty again after the first somewhat embarrassing weeks are over. But there’s more to grooming cats than just ‘getting pretty’. Cats are very well equipped to keep their coat in good shape themselves, and most cats don’t need our help in that. Some cats however can use a little hand. In many cases regular combing by the owner will do. Other cats visit a professional groomer from time to time to get pretty again. Like the longhair breeds or breeds with a lot of undercoat, but also old cats and big cats that aren’t agile enough to fully take care of their coat themselves. Senior cat Ollie before grooming. She has hard, chunky knots all over her body. 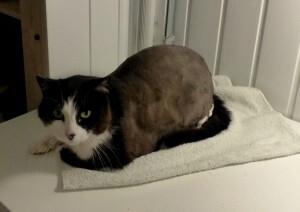 Ollie after the knots were shaved off and the rest of her coat was combed. Now she can move again without mats pulling her skin. Old cats, also the ‘ordinary’ shorthairs, often cannot groom their coat anymore.In most cases there is a medical reason, like arthrosis (90% of the cats above 12 years suffer from this! ), mouth problems (bad teeth, inflamed gum etc. ), organ problems (kidneys, thyroid, diabetes). The coat gets sticky and forms mats. These cats need a visit to the vet, and a groomer can help getting their coat in bettter shape again. Obese cats are less agile and cannot groom the difficult parts anymore that have become too difficult to reach. Mats will form, mainly on the cat’s back, hind legs and tail area. Of course these cats need te loose weight. It’s recommended to consult a vet first, just to be sure that there is no medical reason for the overweight. Shaving off the mats will take away the discomfort, or often even pain, that the cat feels when it is mooving. 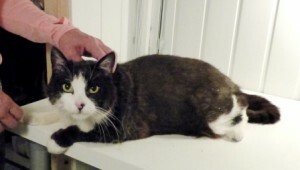 An obese cat has to keep moving, and often needs to move even more. So it’s better to have the mats removed. Snoetje can not groom himself anymore since his accident with terras cleaner. It burned off the tonsils on his tongue and with his smooth tongue he can’t clean his coat. His coat gets smelly, sticky and matted. To prevent that he comes to the salon every 6 weeks for shave and a bath. He is used to it now and feels happy after he is all freshet up again. Ilnesses often lead to a bad coat. Cats tend to stop grooming themselves when they don’t feel well. Fortunately this is only temporary and the caot will get better again when the cat recovers. Cats with chronical illnesses or cats that are somehow disabled is can be recommended to have them groomed. Cats feel better with a coat that is taken care of. For cats with (chronical) health problems grooming can also help keeping their coat in good shape. Health problems can cause a bad coat condition. But the other way around is also possible. Cats with a bad matted coat can really suffer from their coat condition. Helping these cats, and helping cats with a good coat condition staying in good shape, is the main reason for grooming cats. Felted mat from thigh Persian cross breed cat. 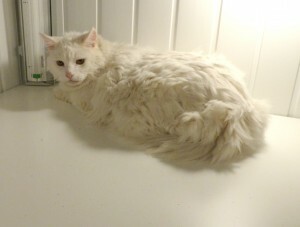 Longhaired cats often need help keeping their coat free from mats, but also shorthairs can get mats. The mats are often for the major part of it attached to the skin. Normally the skin can stretch along with the movements of the cat. Skin that is attached to mats can no longer stretch, so moving gets uncomfortable or even painful. The cats stop playing, postpone litter box visits as long as possible, and don’t like to be caressed or picked up anymore. These cats are not happy. In the next stage the mats have become larger and the tangled hair gets ‘felted’. The felted mats can cover large pieces of skin. Moving is painful and the cat can’t reach the skin anymore with tongue or nails (flees can do their business undisturbed!). If this situation continues for too long and the mats are getting larger and larger cats in this condition may feel so miserable that they get depressed and/or stop eating. Cats that stop eating can get serious (life threatening!) health problems within a few days due to fatty liver disease. These cats are not just ‘not happy’, they are also not healthy and need help from a vet and/or professional groomer a.s.a.p.! But after shaving the cat you can see how thick the felt is! The problem with felted coats is that at first sight the mats can look like normal fur, especially on longhaired cats, because healthy looking hair is sticking out of it. But when you look closely you will notice that you can’t see the skin. If you realize now that your cat’s coat is very felted or matted; please don’t be embarrassed for not noticing it sooner -you are not the first- and contact me a.s.a.p. for a grooming session. Your cat will be grateful! Cat Pretty also stands for ‘get healthy & get happy’ again, and staying that way.